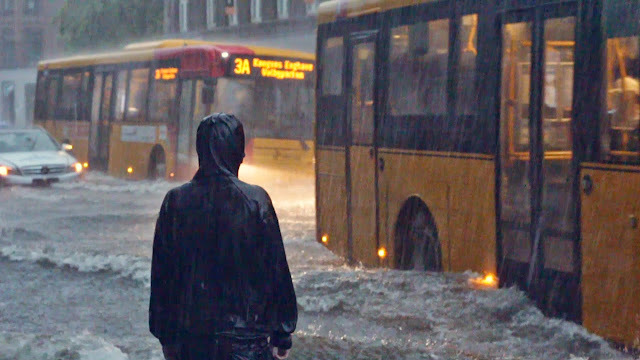 Cloudburst in Copenhagen. July 4, 2011. Photo via DJ Ladze on Flickr. With permission. Climate change challenges are clearly defined in Copenhagen and in Denmark. 1000 km of dikes protect many parts of the country from the sea, but the new threat is the water from within and from above. Our fate has become being inundated with torrential rain that floods entire neighbourhoods. The existing sewer system is completely inadequate to tackle the volume of water from cloudbursts. It is something that is a reality for us living in Copenhagen and in many Danish cities and there is a great deal of political focus on it. Just have a look at this bad boy pdf featuring Copenhagen's Climate Adaptation Plan. There are already many ideas and intiatives on the table in Copenhagen. Much is said and written about creating "Cloudburst Streets", like the one, above. 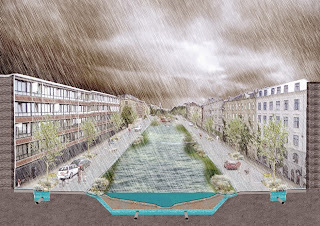 Creating green space that becomes "blue" during cloudbursts and acts as a stormwater delay. Other streets may get a green strip down one side with the same effect. Fantastic. An excellent excuse to greenify many areas of the city and a perfect way to avoid complaining about removing parking spots and whatnot from last-century minds. Greenification of streets and creating reservoirs for overflow of rainwater are fantastic additions to the urban landscape. Exploiting the need for water runoff solutions to create more green space in cities is brilliant. Not every street in Copenhagen, however, has the space to accommodate wide, green reservoirs or green channels. What of the many other streets? Urban space is affected greatly by the new climate reality in Danish cities. It is, however, urban space that can help solve the problem we face. Which is why we are developing The Copenhagenize Current. Like many ideas, it starts with personal experience. 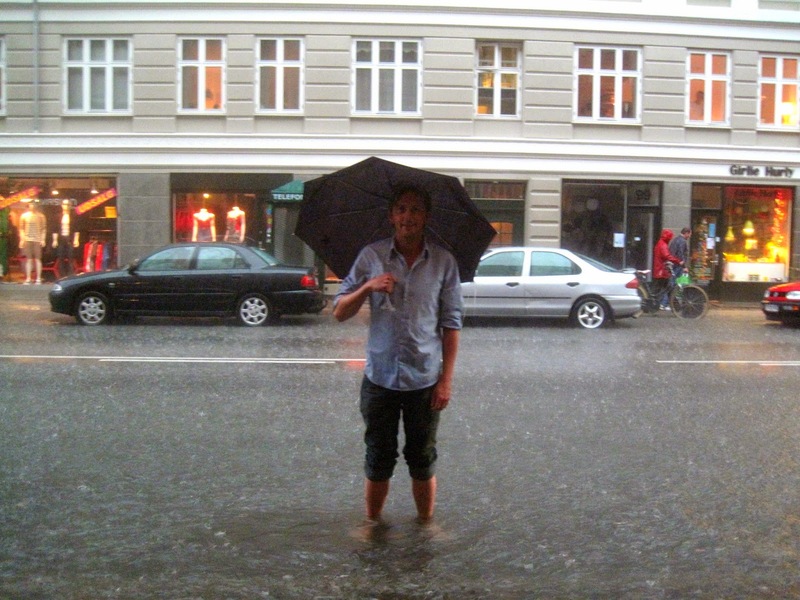 That's me, on the left, on Istedgade in the Vesterbro neighbourhood, during a cloudburst that flooded the whole 'hood. Farther down the street, there were people kayaking. Like many great ideas, it starts in the bathroom of a bar on a Saturday night. We had been discussing climate adaptation in the office at Copenhagenize Design Company. 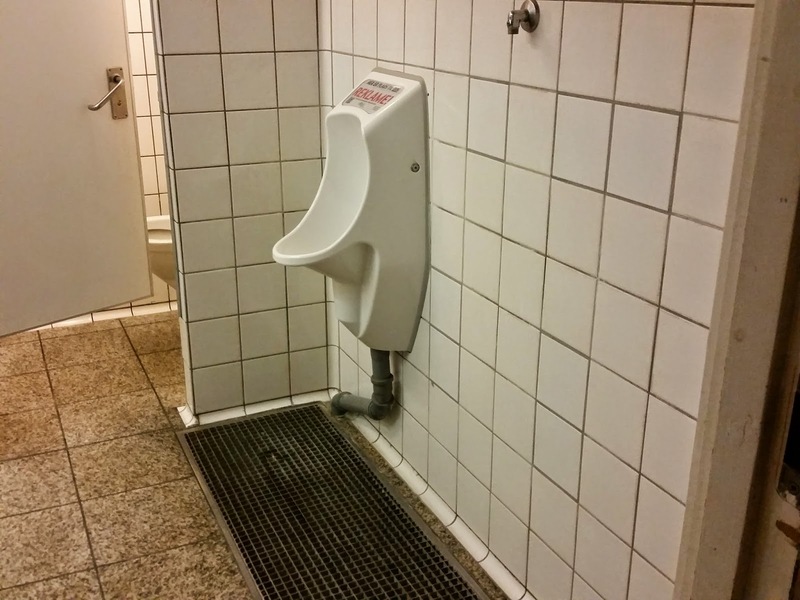 Standing there one night, I considered the existing, traditional system, attached to the wall and then noticed how space on the floor was being used for "excess water runoff" in case of spray or bad aim. A supplementary system that also assists during mopping and general cleaning. Couldn't that simple idea be applied to streets? Including my own, where the businesses in the cellar were flooded beyond repair in 2011? What about using existing urban space to design a stormwater runoff system. Like any good idea spawned in a nocturnal bathroom, you get your kids to help with a Lego model. We have existing space. Copenhagen's comprehensive network of cycle tracks on main streets are there and they're not going anywhere - thank goodness. Real estate that is in use and integral to city life. Bicycles, however, are lightweight vehicles that cause little wear and tear on the infrastructure. Therefore, I thought quite simply, why not create high-volume rainwater trenches underneath the cycle tracks? That is what The Copenhagenize Current is all about. Using existing space for rainwater managment in extreme weather conditions and, while we’re at it, improving infrastruture for the city’s cyclists. 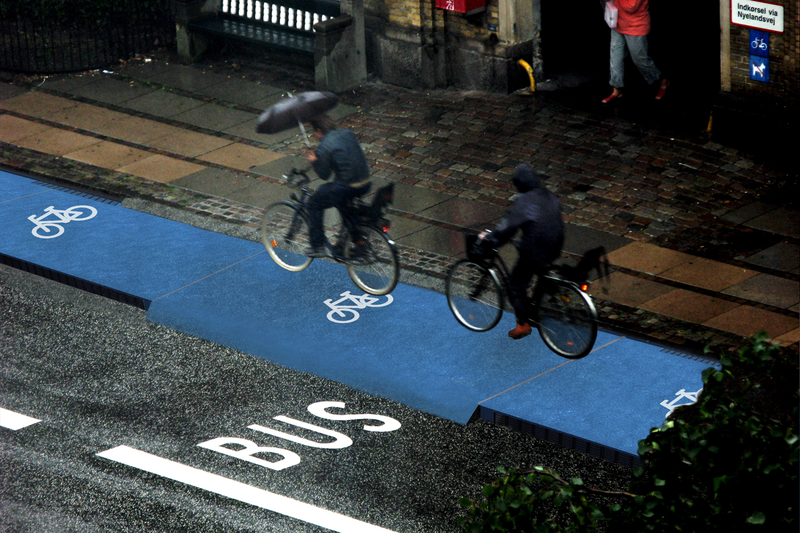 In a nutshell, The Copenhagenize Current involves digging trenches under existing cycle tracks, implementing precast, concrete containers and covering them with pre-fab, concrete slabs. It is a basic cut and cover operation. 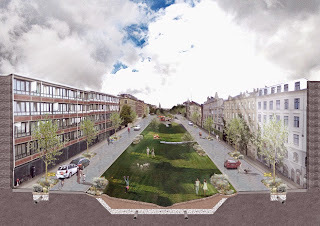 On streets without adequate space for wide medians that can be dug out and act as reservoirs for stormwater, the Copenhagenize Current can act as an incredibly efficient, high-volume system to expedite the drainage of streets and lead water away from vulnerable areas. Copenhagenize Design Co.s architect Steve Montebello has worked on the designs and calculations. 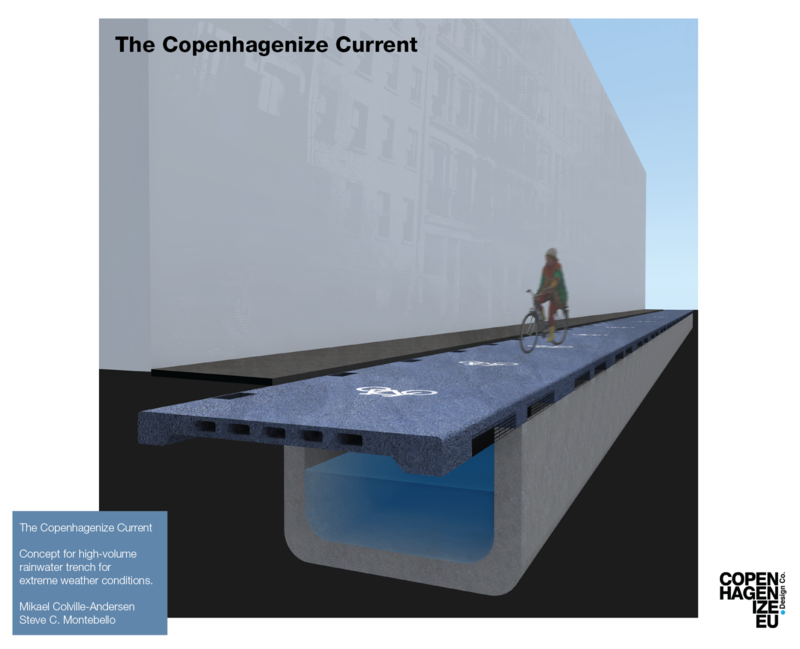 We have designed the Copenhagenize Current to lead high-volumes of water through vulnerable neighbourhoods. 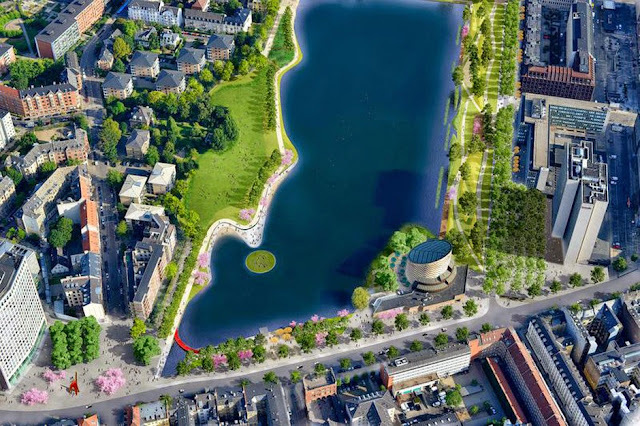 The Cities of Copenhagen and Frederiksberg have been discussing dredging one of the Lakes - Saint Jørgen's Lake - and lead stormwater to it from surrounding areas so it can act as a temporary reservoir. This is what it might look like, complete with redesigned lakefront. The Copenhagenize Current can be used to lead water to such a lake reservoir solution. 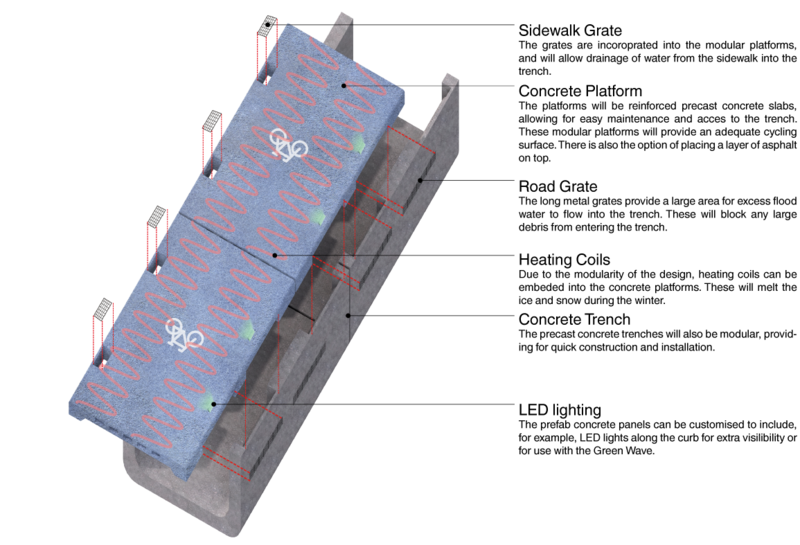 Using pre-fabricated concrete slabs that can bear the weight of thousands of bicycles - and still allow for crossing motor vehicles at intersectionss - allows for implementation of a number of other features. LED lights can be built into the slabs to further visibility of the cycle track. In addition, heating coils can be embedded in the surface, under the final layer of asphalt, to melt snow and ice during the winter. Having pre-fab slabs will also provide a smoother ride for cyclists, minimise the risk of potholes and make maintenence of the cycle tracks easier. So much goodness. The design allows for a maximum amount of drainage grates so that all water at every point can easily fill into the concrete trenches. Grates on the surface will serve to drain water coming from the sidewalk onto the Current. The Current can also work independently of the existing sewer system or together with it, depending on need. The water flow routes in Copenhagen. Most lead towards the harbour or the sea. Apart from the obvious benefits of the Current, namely the fast removal of stormwater from streets and protecting surrounding neighbourhoods and buildings from flooding, there are points that provide an added value to our design. Most cables related to urban life are buried beneath sidewalks and, to a lesser extent, roads. We have considered the idea of creating cable trays on the wall of the concrete trenches to provide easy access to certain types of cables. The design serves an important purpose - stormwater protection for cities. The design can also encourage municipalities that are reluctant about widening existing bicycle infrastructure on certain streets to finally do so by implementing the Current. Gammel Kongevej, with the narrowest cycle tracks in the capital, springs to mind. Maintenance costs on cycle tracks will fall due to the reduced need for repairing potholes. Better infrastructure encourages cycling, as well. The pre-fab slabs are easily replaced on an individual basis if need be. We would love to see the Current end in a pipe that leads under Skt Jørgens Lake or in the harbour. The mouth of the pipe positioned above the surface. During a stormwater surge, the force of the water rushing to the destination will create a fountain. A spray of water - that can be designed - that will celebrate the rain - and the human solutions for tackling it. 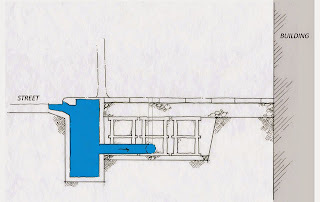 Accommodation can be made for pipes leading off of the Current onto side streets or into parks where silva cells under trees and/or vegetation are located. When the climate - or rather humans - throws you a curve ball, you have to think out of the box. Especially when your box is quickly filling up with water.